Here's the instructional tome you've all been waiting for: Chart Writing Made Easy, inspired by Perry Puccinelli asking me to give a workshop on anything I wanted at the 2nd Annual Sierra Songwriters Festival. 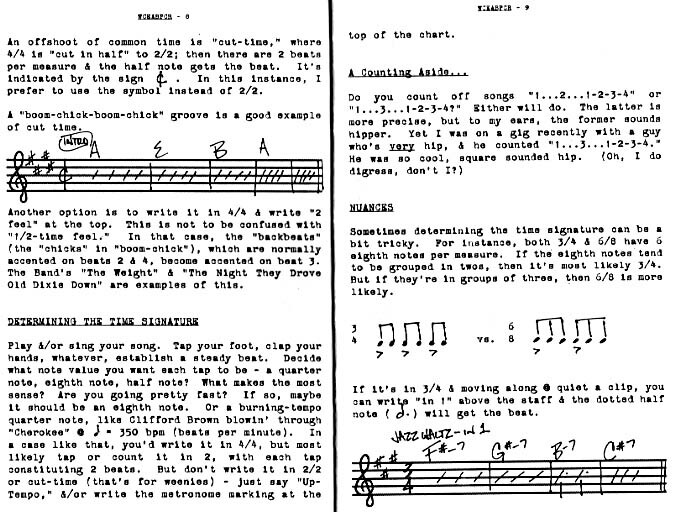 It's a simple, straightforward and fun approach to chart writing, with an emphasis on proper form, notation and rhythms that players and writers of all levels can understand. By writing legible charts that allow other musicians to perform your material, you can turn the songs in your head into music to your ears. "...incredibly useful information for a songwriter/musician, especially if you are going to have anyone back you up...well worth the investment...he helped me improve my own charts, so I can personally vouch for his knowledge in this area. His website is kinda cool too. He's playing his string bass with me tonite in NYC!" Thanks, Robin, for the kind words AND the gig! Heck, why don't you order your very own copy today? You and the folks playing your music will be glad you did. 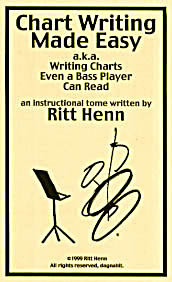 Click here to see an excerpt from Chart Writing Made Easy. Click here to see a chart from the book utilizing the methods explained therein.